When I told friends and family I'd be taking over the Porsche Cayenne from MacKenzie, mouths went agape. Then I said "hybrid." Eyebrows dropped, eyes narrowed, and mouths closed, only after muttering "oh." The Cayenne Hybrid isn't a traditional hybrid, though, and as a "green" vehicle, its stats are lacking. Take our recent test of the Cayenne's Volkswagen twin, the Touareg Hybrid: it eeked out just 0.1 mpg better than the Touareg V-6. The Touareg diesel, meanwhile, bested both by nearly four mpg. Our experience thus far with the Cayenne has been only marginally better. MacKenzie was averaging 19.5 mpg and I'm averaging 19.9 mpg despite an 800-mile mostly freeway road trip. EPA ratings, for comparison, are 20 mpg city and 24 mpg highway. As any environmentalist will tell you, that's not all that green. To get a better idea of the Cayenne Hybrid's real-world performance, I tracked my commute to work for eight days. Per the vehicle's onboard telemetry, my commute is 5.5 miles one way, all on congested L.A. surface streets, and I've averaged 15.4 mpg with a high of 16.3 mpg and a low of 14.8 mpg. My trip averages 18 minutes and 53 seconds, taking as little as 17 minutes and as long as 21 minutes. During that time, the engine spends an average of eight minutes and 40 second turned off, or 46 percent of the commute. I've seen a low of just six minutes, 47 seconds of gasoline-free motoring and a high of 10 minutes, 12 seconds without the engine. The engine always runs at start-up to warm up, usually for the first five to six minutes of the drive before it first shuts off. Great photo and absolutely great car! But Porsche has just publicized a recall for the Cayenne SUV. Not all models will be affected, this includes the base Cayenne, S, S Hybrid and Turbo models. There are more than 100,000 units being recalled, less than one quarter of which are in the United States, and all from the 2011 and 2012 model years. The headlights can become unfastened from the body and drop out, posing a significant safety risk. 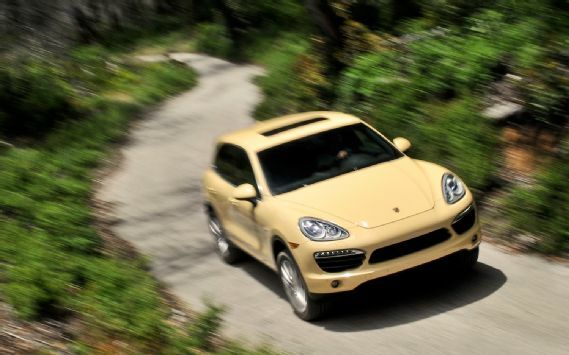 Source of article: Headlight fault prompts Porsche Cayenne recall.